ten at night | go out. spend as if you stayed in. go out. spend as if you stayed in. First spring weekend in NYC and everyones runs for the hills or rather, the most open outdoor spot. For those of us without a rooftop to sun or mask smoke signals from illegal BBQs upon, it usually means running towards the nearest adult playground/beer garden. Beer gardens are a competitive territory in this city. There’s the historic Bohemian up in Astoria, the standard-utility Studio Square in Queens, the sedate Loreley in Bowery, one of my favorites (and, assuredly, a future post as theyre opening a BK location!) and now Berry Park, punctuating a stretch of warehouses parallel to McCarren Park. But these oversize beer meccas often do not a bargain afternoon make. Most steins will knock out a tenner easily. You’re meant to linger, downing until sundown, happy and without worries, so clearly just a single drink won’t do. When debating doppelbocks, for me the choice is clear. Ayinger Celebrator is simply caramalty deliciousness, a perfectly-balanced classic brew that never lets one down. For historic accuracy, this was THE beer that got me into beer, hence had more lingering impact than the boyfriend who introduced it to me. 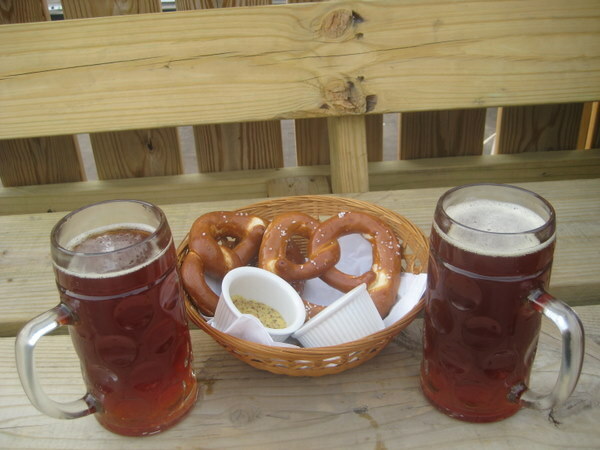 In theory, it pairs with hot Bavarian pretzels like a beach blanket and nap. That is, if your pretz is quality. This one disappointed–which I knew as soon as I saw the waitress grab one from the bin at the end of the bar, room temp and rather too chewy. Slather enough of the delicious peppery mustard and you may partially overlook its flaws. Plus its the best deal going… In other brews, you could go for Deliriums for $9 if you want to speed the sun’s effects. They have some sweeter, berrier brews like Framboise on tap as well, fittingly. One to avoid, Amber–the Palm Amber was bland without properly refreshing. 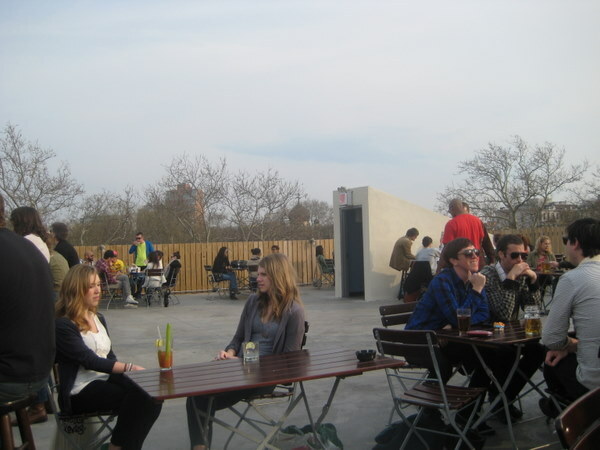 So go for the rooftop and spillover from McCarren park sports teams. It seems to draw a UK-ish crowd with football/soccer streaming projected on the downstairs wall. Still, the atmosphere was low-key with plentiful seating and perimeter benches to accommodate all types of parties. Whether or not your cheeks are smudged with park mud from a bracing bout of rugby, you deserve a towering Weistenhaver! While, it would be helped by cheaper beer list, the 10 buck deal is headed in right ten at night direction. Plus, this rootop in NYC spring?…! Another beer probably…soak in the sun. Manhattan Inn–it sounds a bit generic, like the motorlodge you put your extended family up in under the BQE. But the Anywhere, NY name belies the utterly unique experience of going there. I enjoy ambiance as much as the next bargoer–it’s nice to connect souls or have awkward dates or create dance floors where none existed before in a pleasant setting–however, I usually go for brews over views. When I walked into Manhattan Inn, before even spotting the draft list, this place landed every date/friend/out-of-towner shortlist. Just look around–a beach-washed piano basks in the skylight; the all-wood interior sets a reverential tone. Antique theater chairs, while not the most comfortable, beckon your full attention. Everything is just slightly faded, giving the feel of a place since time gone by or some other, less sentimental, jazz standard. It does purportedly rollick it up for DJ nights (follow on Twitter for a most comprehensive updating: http://twitter.com/ManhattanInn), but I feel I like it best quiet and a bit barren. I could see escaping from the hot-packed jam of Matchless down the street for some ivory-accompanied conversation. To my delight, the beers did live up the to the view–and, if you are flexibly scheduled, the price is right too. On weekdays, 5-7, you’ll get half-off a small, well-curated selection of mostly Brooklyn locals. But it was the Omegang Rare Vos that best suited the environment, a warm amber with a coy streak of spice. …much like the Manhattan. During a wander by the bathrooms, we heard a muffled monologue. Cubbied behind curtains was a surprise art installation–a projection of a cartoonist narrating his high-school notebook-style sketches of pirates and queens. We were transfixed through 2 1/2 viewings–fabulous. 2 Ommegang Rare Vos: during happy hour would be a meagre $6! I’m devoting a bit more space to this section, because for $5 more, you can have one of the most ambient brunches I’ve experienced for some time. Nab the prix fixe for $15, which includes all you see here and unlimited rum brunch punch, which, while not offering the wooziest punch, is generously free-flowing, even once your meal is done. I had an omelet with brie and mushrooms and spinach. 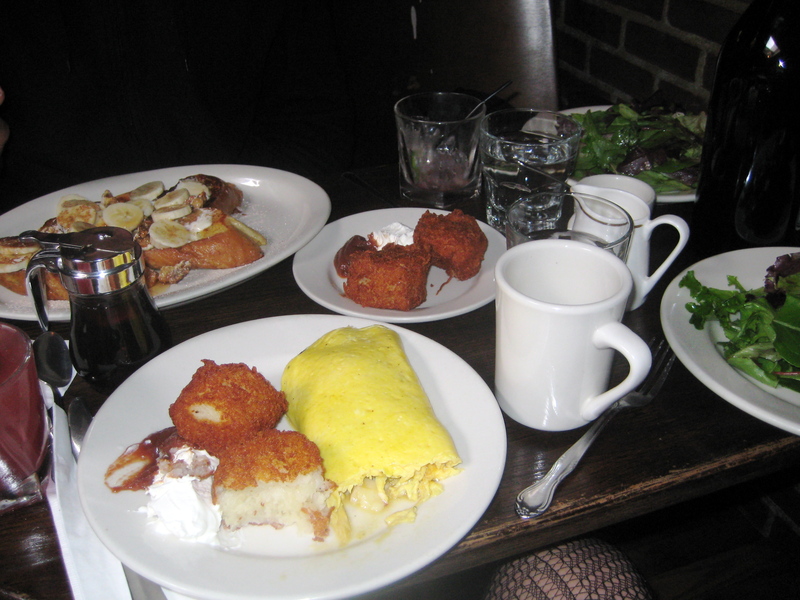 Perhaps even more exciting was the crispy hash-brown mound served with sour cream and apple butter…apple butter! I live right under McCarren Park, separated from cowboy Greenpoint by just a strip of hipster kickball fields and a track with purple exercise equipment. 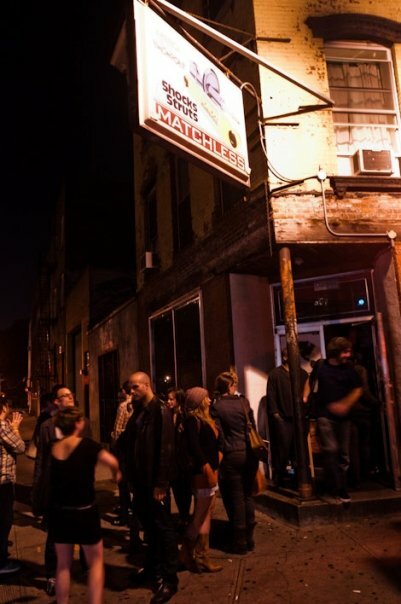 One skinny jeans stretcher jog and you’re at Bar Matchless, the last almost-Williamsburg outpost on the edge of Greenpoint, familiar, yet just a bit wilder. Of course, you can go on a number of evenings and enjoy a low-key time talking to your friends, because everyone will be in private party mode. But, the night to go for the crowds just so happens to coincide with one of the most richly rewarding happy hours around: Tuesday 2-for-1 on well and taps from 8pm, when most BKers who work in the city are ready to venture out again (and everyone else is waking up from their afternoon siestas), until 2am, which, if you work, makes you feel assertively rebellious against the 5-days-of work system–and whoever you are you feel awesome because you just scored 4 stunning beers (or, ok, well drinks) for $10! And what beers to choose from: Brooklyn lagers and pilsners and usually a seasonal; Sixpoint Sweet Action and Bluepoint Blueberry for your sweeter friends; and Goose Island IPA, for, well, me. Most brews are priced at $5 at any hour, so you can mix and match with abandon. I was planning to write this up last week pre-Super Bowl, which would have been a helpful, albeit obvious, way to shove in gaming metaphors. But, if I say you go to Bar Matchless for the social strategy games, you’ll get the gist right? If you are at a packed-to-the-rafters bar holding basically everyone within your 10-block radius with 2-for-1 drinks until the wee hours, it’s pretty obvious why you’re there—and that would be chess. Yes, there is a chess club that meets weekly in the side room with seemingly super-human concentration levels amidst the din, as well as a foosball table, which for some is how you make friends and for others is how you alienate people. Whether you’re into feeling united over spinning those tiny feet just right to score or the bargain price of a good beer, you’ll have reason to cram yourself in. Fuller pockets? Buy another drink and share your token, all friendly-like? I’ve heard tell the food is good and from the smell of them, the bleu cheese wings or mac & cheese would make a very nice counterpoint to that extra Goose Island IPA. Plus kitchen’s open until 3am to capture the appetites of all the remaining 2fer lingerers. Unabashedly, let me put it out there: I love beer list menus with descriptions. (See also Rattle & Hum, The Pony Bar.) I’m just assuming my wedding, should one occur, will have them tucked into the program’s inner leaf. Still, descriptions can be misleading. When I ordered reputable brewer Smuttynose’s Terminator G-Bock, I was expecting some fiery, hoppy blast to steel me for my mission to save the future world from killing machines and beerlessness, not an oddly heavy brew with the syrupy aftertaste of overripe stone fruit. It should really have come with crackers to wipe the palette clean. So I cheated and ordered two more. Elysian IPA, a favorite IPA of mine, strikes the pleasing balance between bitter and smooth. Fisherman’s ale is, as it sounds, a working man’s/woman’s beer, but a full-bodied, well-crafted one–and a bargain at $4 during happy hour. 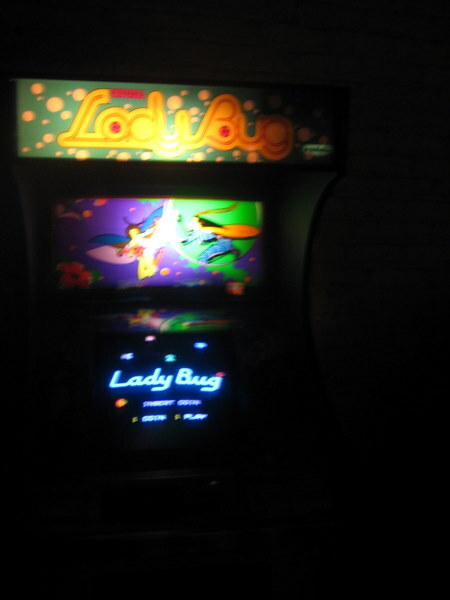 While Barcade on one hand is your spontaneous laundry alternative–a much better use for those quarters you’ve scrounged–it’s also an ideal casually planned party spot. Set your birthday boy or girl up with a goblet of Avery’s Majaraja Imperial IPA, which carries a regal 10.2%, and play lookout for their game of choice. Fuller pockets? You’ll need a full meal after all that pixelated battling. Head to Fette Sau nearby, which serves meat and beer by the pound/gallon! Last Monday was the first I’ve ever made The Bell House’s happy hour window of 5-7. Located on an abandoned warehouse stretch next to Ye Grand Gowanus, it feels like Brooklyn’s resident ghost town. 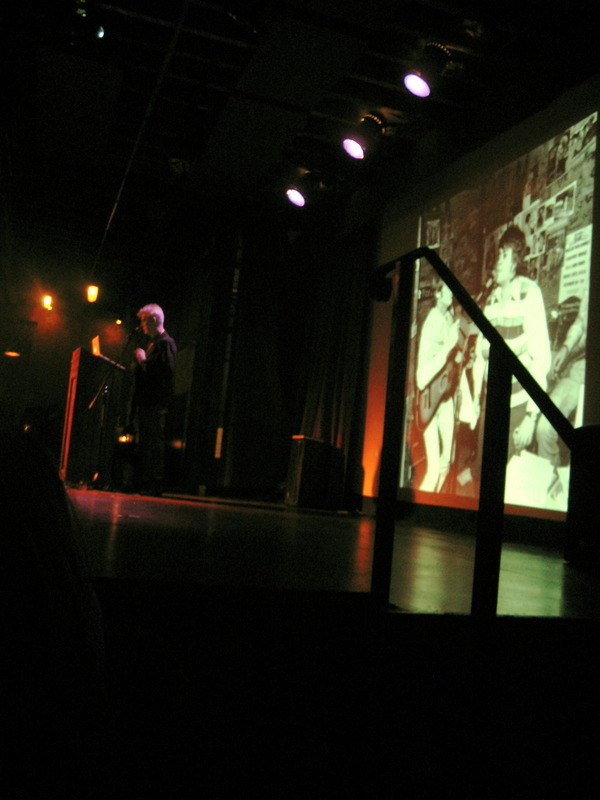 The objective of my hustle was clear: David Byrne, who I’d seen projected on a screen performing with Brian Eno last summer in Prospect Park, would be leading a lecture on art or music or…well, even if it was reciting the NASDAQ, I was going to be there–and I was going to be near. The Bell House as an event space with an eclectic and sometimes bravely uncool range of activities is pretty much unmatched in the city, but first we must cover the unhappier hours. 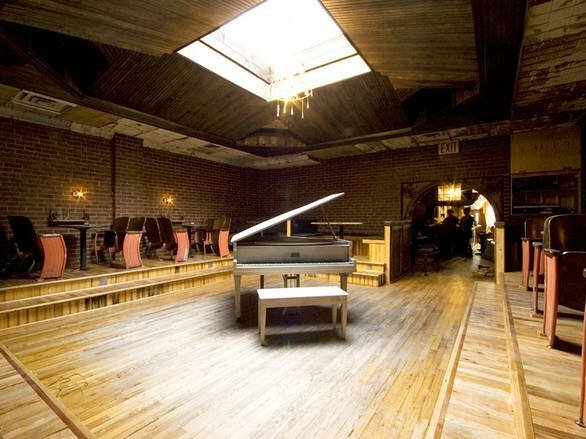 We waited at the main bar while the cavernous venue space–which can hold nearly a Park Slope’s worth of LOST fans–was readied. The bartender was prone to that frustrating line-of-tap-vision–serving anyone who walked right up to him before others, well, us, who’d been sitting further down the bar for a while. All would be forgiven if the promised 2-for-1 on all drinks per the Web site was for real. I felt pretty ready for that 2-for-1 after the silent wander past the canal, where no manner of (non-toxic) living thing grows. You could even say I needed that 2-for-1, aka the nighttime prescription for temporary alleviation of heartache. Alas, the bartender corrected me that I was only to get $1 off my $6 Dead Guy Ale. Diligent happy hour investigative journalist as I am, I’ve inquired about the disparity. Until then, my theory that one could enjoy 2 drinks in the pre-show hours and then one in the venue proved false, Bell House’s status on Ten at Night is suspended. Of course these are quibbles in the larger scheme of things outside saving a buck, and perhaps few people are capable of reminding one of bigger pictures than David Byrne (especially when standing in front of them). I can’t think of a more soothing, world-will-right-itself-in-time evening than one during which the gentle New Wave maestro, with his endearingly earnest podium shuffle, softly guides me through musical history, with speakers occasionally piping brief illustrative bursts of music. You can tell you’re in the right geek-segment of Brooklyn when the audience stays still in hushed, respectful silence, whether a speaker enthuses about particle matter or Renaissance acoustics. However this same audience tends to make the Q&A somewhat unbearable–the chance for those kids who monopolized literary crit class to launch self-referential monologues. Next time this is my window to head back to the bar. The House hosts any number of awesome geek-tinged events from a LOST premiere party with pre-show performance by the plot-jogging Previously on Lost band. The Eugene Merman-curated Tearing the Veil of Maya has featured such wordy comics as Michael Showalter and perhaps too big for BK now, Zach Galifianakis. (Not-so-)Secret Science Club monthly on Tuesdays gathers astronomers and Arctic biologists to make you long a little less for college lectures of yore. And, of course, where else can you show off your Victorian stuffed vole panorama than at the annual Taxidermy Competition? Just find your 2-for-1 elsewhere and revel in actually learning something out. Fuller pockets? Grab a dub pie, the gourmet hot pocket, or slow sip one of the seasonal Brooklyn brews on tap. Lomzynianka-Eat (pierogies), Drink (your own booze) and Be Merry! Your New Year’s resolutions may or may not include consuming more and massive quantities of meat and potatoes, but they should definitely make room for finding your go-to BYOB–for those times when you have leftover holiday bottles of wine, but regrettably no longer any holiday leftover food to accompany it. Well, at least as long as winter weather draws me towards comfort food, I have found my kitchen-away-from-home standby. Lomzynianka, just North of McCarren Park on the edge of Greenpoint, has a menu of meaty bargains that will satisfy those with Polish grandmothers (as my friend P_ can attest) or those who just wish they had. The $8 Polish Platter provides really all you could ask for to cheaply achieve your most humanly possible fullness levels. 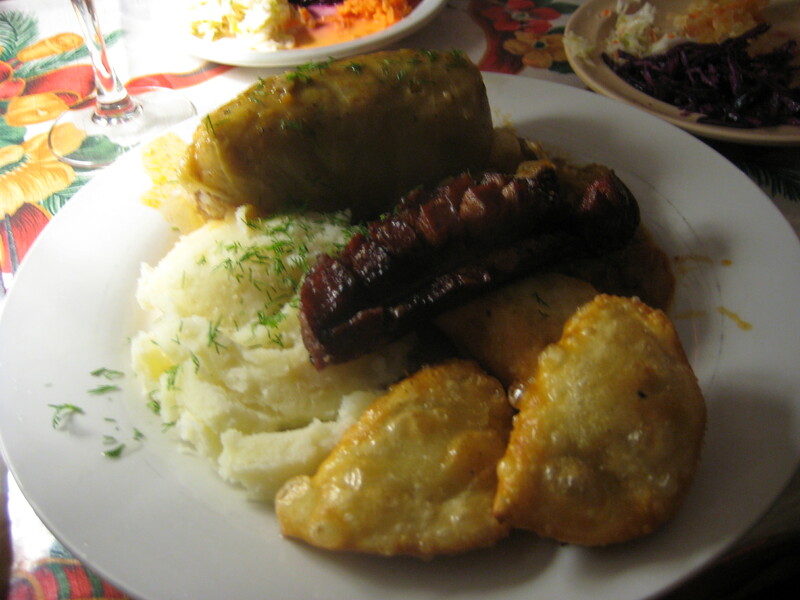 Three crucial food groups–why, cabbage, starch and pork, of course!–are conveniently provided in log (cabbage roll) and stew (bigos) form with sides of pierogies and mashed potatoes…oh, and for you straight-up meat lovers, a strip of spicy, greasy kielbasa draped on top. Alternatively, you could share some al la carte pierogies for about $5 a plate. I particularly liked the earthy mushroom and sauerkraut, but the farmer’s cheese and potato and cheese appeal to a sweeter palate. As this is our first (but certainly first of many) BYOB review, a category that deserves much attention for its casual night out potential, the golden words in this category are ‘no corkage fee.’ Not only does Lomzynianka not blink an eye whether you bring one respectable merlot to share or the entire contents of your 5-person-shared loft’s beer fridge, they’ll provide a corkscrew and as many glasses as you need. The interior feels like something your real or figmented Polish grandmother would design–well after a potato vodka bender–chintzy multi-color parlor wall paper and flower oil paintings that look as if they were done in a steam room. The be-tinseled mounted deer head neatly tied the bow on my 2009 holiday experience. So, still full with pierogi and feeling the lingering contentment of a free-flowing dinner with good friends, I feel fortified to make a New Year’s resolution or two of my own. I pledge more frequent posting on Ten at Night, at least a review a week, and to expand, perhaps throwing some home entertaining ideas into the mix. Be prepared to hear a LOT about liquor infusions. And, word on the street (well, OK, aisles) is a new $2.99 six pack has landed in NYC Trader Joe’s from a Wisconsin brewery. I will try to be the first to cheaply toast you in 2010! Have a happy, healthy (but most of all happy) New Year! Free if you have some wines or six packs lying around the house. It may be helpful to justify your haul in these terms: the more you cart, the bigger the appetite-building aerobic workout. Fuller pockets? Send the least starch-sedated diner out on a wine run to nearby Greenpoint Wines and Liquors at Nassau or blimp out on some cheese blintzes. d.b.a. 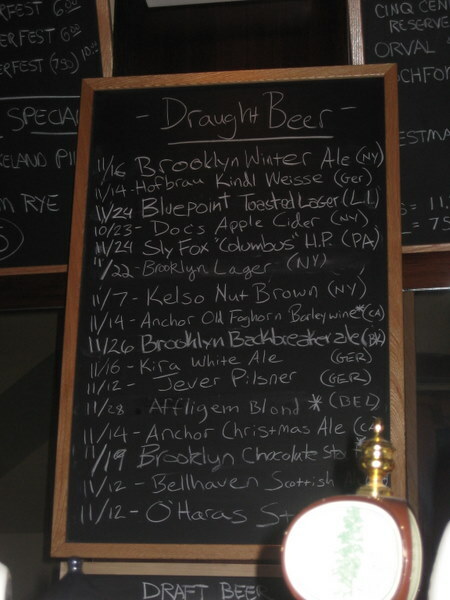 Brooklyn–in the bleak midwinter…cheers yourself with winter ales! Less crowded than its LES counterpart, perhaps because it was Saturday after Thanksgiving weekend when most smarter folks are still digesting or organizing their black Friday purchases into gift piles, or perhaps because BK d.b.a. still isn’t as ‘discovered.’ Either way, stools came easy…it was decision that thwarted our drinking progress! The chalkboards nearly covering one wall host an international legion of drafts and bottles. While not a jaw-dropping good deal, from 1 to 9pm you get $1 off all drafts, which makes all national brews a palatable $5 and a hefty range of international ones $6. I wish I could say I discovered Anchor Winter Ale. Instead my roommate was inspired to order it and after one sip I regretted my perfectly decent (great even, in any other company) IPA. I would if musically talented compose a carol to this amazing brew–hitting its notes of apricot and fireside and richness with a hearty yuletide alcohol kick. Sipping it could make you feel sophisticated even in a reindeer jumper. Slyfox HP, while clearly in Anchor’s shadow, was a crisp with a stealthy bite. The muffaleta, basically the only item on the menu appeared delicious with layers of meats and cheese on a soft roll, though our leftover turkey sandwiches had rendered us incapable of anything other than beer (which despite our recently increased stomach capacity was still a stretch). Gaze upon the massive list of options on their wall and you will find a way to stretch further. Fuller pockets? Help finish up the oldest draft on tap, which washes down easy at half off.